Both indices recorded the biggest single day fall since August 2, when the BSE had lost 356.46 points and the NSE Nifty 101.50. The broader NSE Nifty closed below the 10,600 mark by plunging by 98.15 points, or 0.84 per cent, at 11,582.35. 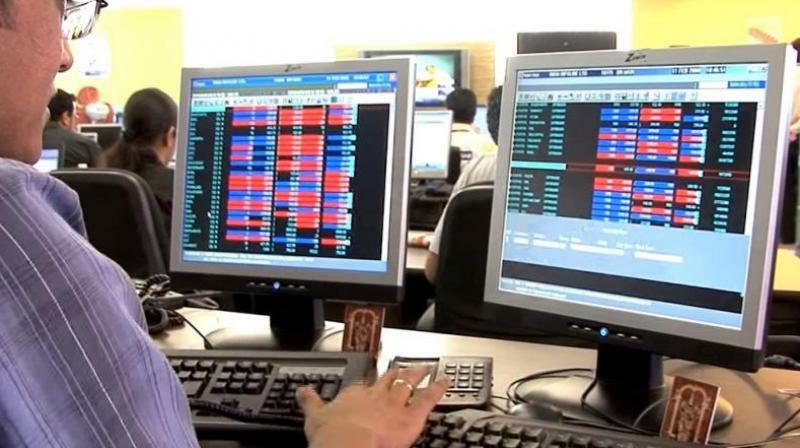 Mumbai: The BSE Sensex erased all its early gains to end lower by about 333 points in see-saw trade on Monday, posting fourth straight session fall due to widespread selling in FMCG, realty, power and banks stocks amid the rupee hitting yet another record low. Weakening global cues, triggered by continuing trade war spats between the US and China, too impacted domestic market sentiment. The Indian currency collapsed to a new lifetime low of 71.10 in intra-day trade, raising concerns on the macroeconomic front. Adding to the woes, the country's manufacturing sector activity eased for the second consecutive month in August. Selling was more pronounced in FMCG, realty, power, banking, auto, oil and gas, PSU, IT, teck, infrastructure and capital goods stocks that dragged the indices into the negative zone. Major losers were HUL, PowerGrid, ITC, M&M, Maruti Suzuki, ONGC, TCS, Asian Paints, RIL, Hero Motocorp, Tata Steel, Infosys, L&T and Tata Motors, falling up to 4.58 per cent. Banking stocks such as Axis Bank, ICICI Bank, Kotak Bank, Yes Bank, SBI and IndusInd Bank fell as much as 2.69 per cent today. The 30-share Sensex had soared over 289 points to hit a high of 38,934.35 in early trade boosted by good first-quarter GDP data and recovery in rupee but gave up its gains completely following late sell-off, which dragged it down to a low of 38,270.01 after data showed that manufacturing PMI has slowed in August. It finally settled at one-week low of 38,312.52, showing a hefty loss of 332.55 points, or 0.86 per cent. The gauge had lost 251.56 points in the last three sessions. The broader NSE Nifty closed below the 10,600 mark by plunging by 98.15 points, or 0.84 per cent, at 11,582.35 after shuttling between 11,567.40 and 11,751.80. Both indices recorded the biggest single day fall since August 2, when the BSE had lost 356.46 points and the NSE Nifty 101.50. Meanwhile, foreign portfolio investors (FPIs) sold shares worth a net Rs 212.81 crore while domestic institutional investors (DIIs) were net buyers to the tune of Rs 171.92 crore on Friday, as per provisional data.